Robert Harris seems to be on a mission to prove that you can find drama anywhere. Or at least, to demonstrate his ability to bring inherently dramatic situations more vividly to life. One of his early works, Enigma, injected additional drama into the already fraught industry of breaking of Nazi codes during World War 2. In his trilogy focussing on Cicero he drew out the political parallels of ancient Rome and the present day. And in An Officer and a Spy (reviewed here) he created a spy novel and legal thriller around one of the greatest miscarriages of justice of the 19th Century. 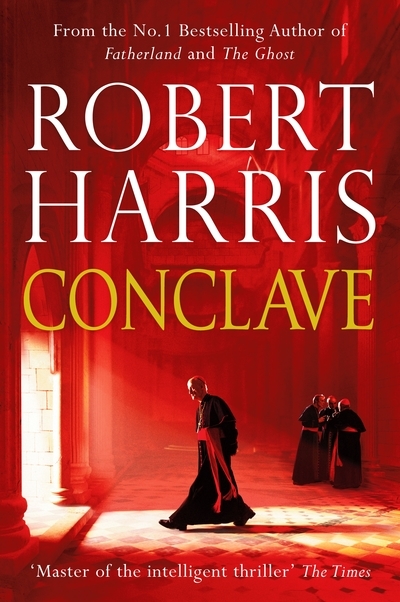 In Conclave, Harris turns his attention to the arcane practices surrounding the election of a new pope. And in his hands it turns out to be both as fascinating and as deeply human as all of his previous books. The reader’s guide through Conclave is Cardinal Lomeli, Dean of the College of Cardinals. It falls on Lomeli to organise and run the election of the new Pope when the previous Pope dies. This involves gathering over one hundred cardinals from around the world and sequestering them in the Vatican, away from the eyes of the world, until they can agree on a successor. To be successful a candidate must obtain over 75% of the vote. When a vote fails to reach the required majority black smoke emerges from the Sistine Chapel. It is only when white smoke is seen that the outside world knows that a new Pope has been decided. While the religious view is that the final decision is guided by the hand of God, Harris shows the processes as anything but. Lomeli himself is having a personal crisis of faith but is seen by others as an outside contender for the role. In full competition are four of his fellow cardinals already in positions of power within the Vatican. As each vote passes without a clear winner, Lomeli finds himself investigating rumours about these four, testing his faith, his belief in the former Pope and his political acumen. But also, as the rounds of voting continue, finding himself in the running partly as a result of his investigations. While the text is liberally sprinkled with nuggets of information about the papal voting process, discussion of previous elections and descriptions of the Vatican buildings they only serve to illuminate what is first and foremost a political thriller. And few do these better than Harris. The structured voting processes provides the perfect scaffold for carefully laid revelations and bombshells both figurative and literal to be thrown into the mix. And while some readers may find the final twists a little hard to take, Harris has laid the groundwork for them and they perhaps reveal something of his true theological colours.